The Hyde Park Picture house in Leeds contributed more to my film education than any other cinema ever. Not even the National Film Theatre comes close. You can read about my Leeds experiences in “THE DAYGLO DIARIES” which can be downloaded from this site. I first went to the cinema on Saturday 2nd March 1963. I was seven. The cinema was the ABC Regal in Great Yarmouth. The film was Harold Lloyd’s World of Comedy. My father must have thought it would be suitable for two young children, and no doubt remembered Harold Lloyd from his own childhood. Harold Lloyd had kept tight control of his films over the years, and had not allowed them to be constantly exploited. In 1962 he assembled a compilation of extracts from his comedies, and screened the resulting film, to great acclaim, at the Cannes Film Festival. By March the following year it had reached Great Yarmouth. We had a small black and white television at home, so the idea of moving pictures wasn’t new to me. When we took our seats on the front row of the circle I wasn’t sure what to expect. I’d been told that cinema was like television, only bigger. So I was looking around for a large TV. I couldn’t see one. My father told me the screen was behind the curtains. The lights would go down, the curtains would open, and I would be able to see it. Even so I was worried. The auditorium was so big that I didn’t think we would be able to see even a big TV clearly from that far away. When the curtains opened, and the first images appeared I couldn’t quite believe how big the screen was, and how clear the pictures were. It was certainly nothing like TV. The screen seemed to me to be easily the size of a house. In a large cinema, in the sixties, the screen was significantly bigger than a multiplex screen today. I watched Harold Lloyd dangling from the arms of a clock, imprisoned in a cell with a giant, and staggering about on top of a building. I laughed and laughed. According to my parents the few other members of that Saturday afternoon audience were amused more by me than they were by the film. There was another surprise in store. The supporting film, The Wild Westerners, was in Technicolor. These were the first colour moving images I had ever seen. I can still vividly remember a knife fight between two Indian women, and the saturated colours of the sky and the grass. From then on I was fascinated by projectors, photography, electronics, and anything to do with film and film technology. For every birthday and Christmas I wanted a projector, or a camera, or some piece of darkroom equipment. Over the next few years I was given various film strip projectors, and a Chad Valley hand cranked movie projector, with some old silent films. 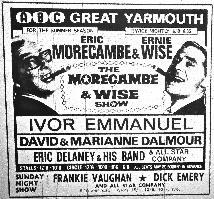 On the afternoon of Sunday February 14th 1965 we paid our first visit to the Empire cinema on the sea front at Great Yarmouth to see a double bill of I’m All Right Jack and Two Way Stretch. There was a small argument at the box office before we went in. The cashier said children couldn’t go in for half-price on a Sunday. My father asked to speak to the manager. It was a cold Sunday afternoon, out of season, and there weren’t many people about. My father asked if the performance would be sold out. The manager said that was unlikely. My father said we weren’t going in unless my sister and I got in for half-price. A deal was done, and we went into an almost empty cinema to see two classic British black and white comedies. The Empire was a second run cinema. Mostly it showed films a few months after they had already been shown at either of the ABC cinemas. Or, as on this occasion, two older main films as a double bill. This was something of a bargain, because the ABC generally showed a main film followed by a supporting film, which was often a low budget film, with no stars, which was just there to fill up the programme. 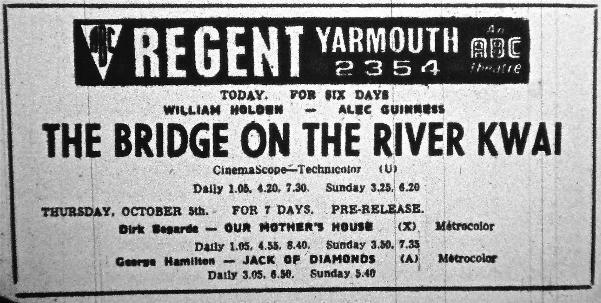 During the Easter holidays, in April 1965 we all went to the ABC Regent Cinema in Regent Road, Great Yarmouth, to see Tom Thumb. The supporting film was The Wizard of Oz. Both of these films were a few years old, but had been revived as a treat for children during the school holidays. The Regent was also the cinema which hosted ABC Minors every Saturday morning. My sister and I went fairly regularly. If our parents had any shopping to do they used to drop us off at nine-thirty, and pick us up three hours later after we had enjoyed various cartoons, a serial, and a feature film often produced by the Children’s Film Foundation. Every Saturday we sang the ABC Minors song, followed by Happy Birthday. If it had been your birthday during the previous week you were invited up onto the stage to receive a small gift. (Probably sweets.) The same children went up week after week, only occasionally being told their birthday had come round once too often. Some children smuggled in pea shooters, and pocketfuls of ammunition. When my father was a child they had a single living target, in the person of the organist who accompanied the silent films. By the 1960s they used to target one another, and quite often dried peas would ping off the top of your head if the children behind became bored with the film. On one occasion I was nearly thrown out by an elderly usherette (probably in her early forties) despite the fact that I had never owned a pea shooter, and had no ammunition. There were no restrictions on stop and search in those days, so after a cursory examination of my pockets I was allowed to take my seat again. 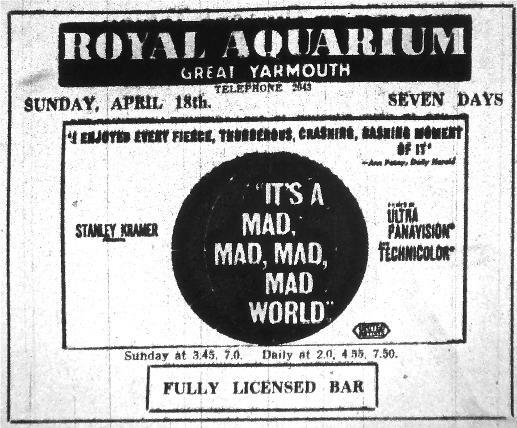 Another of the main cinemas in Great Yarmouth was the Royal Aquarium. There was a fish tank in the foyer, and a larger aquarium filling one wall of the corridor as you walked from the ticket office to the cinema. During the Easter holiday in 1965 we went to see a very long American film called, It’s a Mad Mad Mad Mad World. To me it seemed to go on forever, although I certainly wasn’t bored with the broad comedy, which was reminiscent of silent films. The Royal Aquarium boasted the largest screen on the east coast. It was massive. And the film had been shot in Ultra Panavision 70 which produced an aspect ratio of 2.76:1 (although we probably saw a 35mm Cinemascope print). This was my first experience of very widescreen cinema and I was certainly impressed. Sometimes the thing which made the greatest impression on me was not the film I’d gone to see, but the trailer for the film showing the next week. In May 1967, at a screening of Mutiny on the Bounty, I saw the trailer for The Camp on Blood Island. It looked like an exciting prisoner of war movie, set in a Japanese run camp. Unfortunately it had an ‘X’ certificate, which meant I couldn’t go to see it. Later I learned it was a Hammer exploitation film, using the atrocities committed on British prisoners of war by the Japanese to attract an audience. I can still remember the excitement of the trailer. Similarly, at a screening of Triple Cross at the Empire in May 1968, I saw the trailer for Bonnie and Clyde. I badly wanted to see the film, but once again it had an ‘X’ certificate. It wasn’t until the Royal Aquarium decided to run it again in 1973 that I finally got to see it. My father sometimes took me to see films which my mother and sister didn’t want to see. One of these films was The Bridge on the River Kwai in autumn 1967. The film had been made about ten years before, and had returned several times over the years. It seemed to me to be a cut above the average British or American films of the period, both in terms of acting, and how the film was made. For some reason the name of the director (David Lean) lodged in my brain. A few months later in February 1968 the whole family went to see Doctor Zhivago, which had just arrived in Yarmouth for the first time, and was showing at the Regal. I loved it, and I particularly liked Julie Christie. Once again it was clearly a much better film than most. And once again the director was David Lean. That was my introduction to auteur theory. We rarely crossed the river. Gorleston was another country. However my father could occasionally be persuaded to go to the Coliseum, which he described as a flea pit, if there was no other alternative. In fact the Coliseum was a purpose built, art deco cinema, which I rather liked. In April 1969 it revived two fifties RAF war films in a double bill. So my father and I ventured across Haven Bridge on Easter Monday and went to see The Dam Busters, and Reach for the Sky. I’d known about The Dam Busters throughout my childhood, and so at the age of thirteen it was a treat to finally see it on the big screen. Once I was a little older we sometimes went to the cinema in the evenings. In those days the national anthem was played at the end of the performance. As the lights came up, and the first bars of the music could be heard, people began to stand. I had just begun to edge off my seat when I heard my father’s voice. “You stay where you are.” As a socialist, who believed in the abolition of the monarchy, he wasn’t going to have us showing them any respect. Everyone else stood up, but we remained seated. Some people looked at us curiously, but no one said anything. Some of the cinemas in Yarmouth weren’t just used for showing films. Every now and then the Regal would be taken over by the Great Yarmouth Amateur Operatic and Dramatic Society, mostly for the production of a musical. 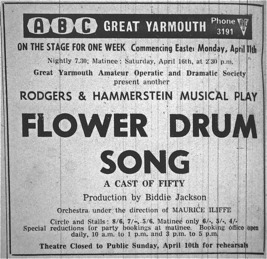 During April 1966 The Flower Drum Song was playing for a week. Our tickets had been booked some time in advance, and I was looking forward to it. Unfortunately I became ill on the morning of the performance, with a stomach bug, and spent part of the day in bed. By late afternoon, although I still didn’t feel particularly well, I told my parents I felt better. They decided I was well enough to attend the evening performance, and we all set off for Yarmouth. We took our seats on the second row of the circle. Not long after the performance started, I began to feel worse. The heat, and the darkness, didn’t help. There was also a slight feeling of claustrophobia, caused by being in the middle of a row, and not being able to get out. Steadily that sickly feeling grew. I swallowed hard several times, trying to prevent what I knew was about to happen. Something must have alerted my father. Perhaps it was the swallowing, or some noise that he had come to associate with impending disaster, or maybe he was psychic. Whatever it was he managed to get his flat cap in front of my face just in time to prevent many people in the stalls from having a very bad night indeed. Somehow I went out of the auditorium, through the upstairs lobby, and into the men’s toilets, without my feet touching the ground. By the time I landed I felt a lot better. My father flushed his cap down one of the substantial 1930s toilets, and we went out to join the rest of the family in the lobby. By this time I had made a full recovery, and wanted to go back. I didn’t understand why my father said we couldn’t. It was something to do with the peace of mind of the rest of the audience. I never did see the end of The Flower Drum Song. In the summer several of the cinemas put on a live show for the holidaymakers. These shows ran from Monday to Saturday, with a special one off performance on a Sunday, to give the regular performers a break. All the top television stars came to Yarmouth. In 1967 Morecambe and Wise were at the ABC Regal for the season. Sunday night shows in earlier seasons included The Rolling Stones, and The Beatles. Gradually some of the cinemas disappeared. The Empire initially closed every winter, the Regent became a bingo hall, and the Coliseum and the Regal were demolished. From the seventies onwards many of the films were unsuitable for a family audience, and we went to the cinema less and less. When I got my first car in 1974 I began going to the cinema again on a regular basis. Sometimes it was in Yarmouth, but often it was in Norwich, where I discovered a greater range of films. My favourite cinema was certainly the Noverre, at the Assembly Rooms. 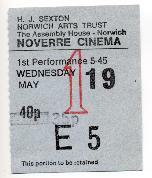 Every month it was taken over for a week by the Norfolk and Norwich Regional Film Theatre, and showed a selection of the best of European cinema, and the new wave of American cinema. Early highlights for me were Cries and Whispers by Bergman, Lacombe Lucien by Louis Malle, and The King Of Marvin Gardens by Bob Rafelson. On Sunday 14th December 1975 I went to the ABC on Prince of Wales Road to see American Graffiti by George Lucas. It wasn’t the first time the film had been shown in Norwich, and it was the second time I’d seen it. On this second viewing it seemed even more impressive that it had the first time. What was unusual however was that no one tore my ticket in half as I entered the auditorium, so I kept the complete ABC ticket as a souvenir. On Wednesday 19th May 1976 I saw one of my favourite films of the seventies. The Passenger by Michelangelo Antonioni was showing at the Noverre for a few days. I went with a friend from the art school. Tickets for the first few rows were cheaper, and since neither of us had much money we saved a few pence by sitting at the front. In the Noverre the screen was quite high, so if you sat too close you had to slouch in your seat, and rest your head on the ridge at the back, in order to avoid neck ache. In late September 1977 I went away to college, and apart from holidays, I didn’t return until 2003. By then the Noverre and the ABC on Prince of Wales Road had closed.